Of all the amplifiers we manufacture here, it's no secret that the Zen SELECT (SE84CS) is the overwhelming favorite. We have good reason to believe it may actually be the best sounding amplifier in the world. While I've maintained similar sonic's in all of our other amplifiers the benchmark has always been the Select. As hard as I've tried for the past several years I have not been able to improve upon it. Until NOW! In comes the Zen Signature Monoblocks, the closest thing to our little Select. They were designed to keep the same sound but with over twice the power and have a signature look representing DECWARE's very best. Over the years, those with modestly efficient speakers between 89 and 92 dB/1 watt who started out with a Select found the mono blocks a significant upgrade because of the ability of these amps to better drive their speakers. However, those who have speakers that are efficient, between 95dB and up, found that in certain ways the Select sounded better than the monoblocks when driving the same pair of speakers. This is proof that simpler IS better when absolutes are concerned. 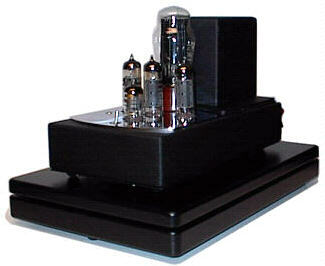 The only difference between the Signature monoblocks and the little Select is three tubes per channel vs. one. There is a certain purity in having a single tube per channel. This can be heard on top grade high efficiency speakers such as Lowther, Fostex, and many others. This can not be easily heard on conventional speakers because much of this delicate information is lost in the speakers crossover network. That said, the focus of all this is the insatiable craving for more, and the unwavering curiosity to see how much if any better it could get. By the time a person reaches this point, money is far less of an object. Suddenly we find them paying hundreds of dollars for individual tubes just to see if it could make an improvement, and trying various tweaks usually ending with a phone call to me wanting to know if money was no object could I improve their Select in any way. The answer to this question has always been NO because their isn't anything else we could do to improve it's sound as a production amplifier. Currently, the Signature monoblocks are wired with three tubes in parallel and connected to an output transformer with close to 1/3 the primary impedance of the transformer that is used in the single tube per channel Select amp. Obviously these two transformers are going to have a slightly different signature. And multiple tubes in absolute terms is not going to be as transparent as a single tube. There was also a Dual Core Option available on the Signature monoblocks designed to enhance versatility by changing the signature and performance aspects at the flip of a switch. In this instance, there are two output transformers, the standard 3300 ohm and an original 9800 ohm model. These were wired in such a way that one or both could be used. When both were used more RMS power was achieved and fascinating results that varied widely from one speaker to another. These results were in short about imaging. Generally with the dual core option engaged, the amplifier would add bloom where there was none - ideal for less than perfect recordings. I thought the Dual Core idea was pretty clever, and many customers purchased these amps with the Dual Core option and liked it, even though many probably listened to the amps without the option enabled. Needless to say I really couldn't find any other ways to improve our Signature monoblocks and they've remained unchanged since then. Something DID happen. A change in thinking on my part brought on by many phone calls from thrilled Select owners wondering if it can possibly get any better, and by a light at the end of the tunnel regarding loudspeakers. ( It was my hope with our Radial loudspeakers that we would have a perfect match for a single Zen amp or Select. That meant an efficiency of 95dB or higher. It didn't happen because it's 360 degree dispersion eliminates you from hearing more than part of it's total output. That means that in the listening chair they measure the same as a 90 dB speaker. Recently things have come to pass that will enable us to sell a few different speakers that are 96dB and crossoverless at a very reasonable price. These type of speakers are a perfect match for a single Select amp, and frankly better sounding than almost all main stream audiophile speakers. Because of this, rather than having to up sell a customer to one of our larger amplifiers so it will drive his present speakers, I can simply get the right pair of speakers in his hands and sell him a Select amp. To please the Select owners who already have the right speakers the only thing I could have done was change the signature monoblocks to a single tube amp. In this way it would be exactly a Select amp except that it would be dual mono and have twice the power supply. That I can tell you is the only way to improve a Select amp. My solution to all this was to wire the Signature Mono's in a way that exactly duplicates each channel of a Select with identical parts while at the same time maintaining the ability to run multiple tubes for added power when desired. By reconfiguring the amplifier as shown above, it is possible to switch between a single tube (center one) driving the original 9800 Select output transformer OR run the outside pair through their respective transformer. The circuit was designed so that the unused tubes - be it the center one or the outside pair - can be removed without damaging the amplifier or left in at all times. To maintain absolute duplication of a Select when in the single tube mode, the output transformers are left to float with no reference to ground - just like the Select. Also, the input tube which is a dual triode is no longer wired with both halves in parallel to better drive 3 tubes. It is now segregated so that one half drives the single tube exactly like a Select, and the other half drives the outside pair. Better dynamics from a now even more bottomless power supply. Better resolution from the high mass chassis's lower resonant frequency. Slightly blacker backgrounds resulting from both things just mentioned and better RF and Magnetic shielding from the superior chassis. You may also notice the difference in stereo separation when it goes from around 50 dB to the limits of your CD player which can be as much as 100 dB Cross talk is virtually eliminated. Another thing you may do is place the amps by your speakers reducing the length of your speaker wires by at least 1/2. That is usually a very noticeable improvement in any system. Because there is nothing wrong with the original SV83M signature monoblocks which are better suited for normal speakers, we plan to continue selling them exactly as they are.. We will be discontinuing the Dual Core option however and replacing it with the new SV83S as described in this paper. The S designation stands for "SELECT". We hope you enjoy this relentless pursuit of absolute fidelity because for those of us in the know, it really IS worth it.